While Lenovo shares its futuristic concept of a new laptop with a flexible screen (June 2017), others like Samsung file patent applications on the exact same matter. 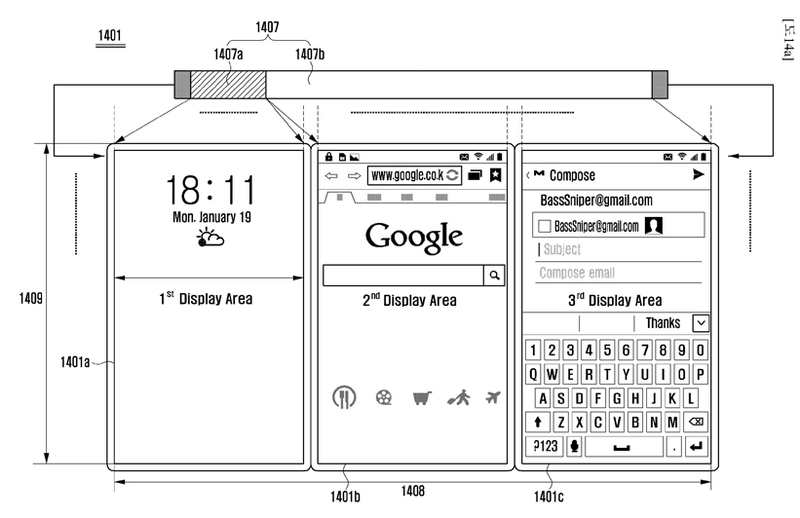 It seems like the future of personal computing is all centered on the screen flexibility. Though, companies are struggling with this concept for almost a decade by now and hundreds of patent applications were filed and published in this period, the only every-day life result of their hard work that we see are curved monitors of TVs and smartphones. So why not fancy a bendable laptop with a flexible display with a projected keyboard directly on your working surface or something similar…. but with a regard to the patented technology by now? Let’s give a quick glance, for instance, at what Samsung will most probably bring to the market in the nearest future. Samsung is already known for building flexible displays. In October 2013 at CES (Consumer Electronics Show), Samsung first presented its concept of a flexible device called Youm. But their PCT patent application n. PCT/KR2017/000217 (publication n. WO 2017/179799, Korean priority KR 10-2016-0045052 filed on 12.04.2016) published in October 2017 has given us a chance to glance at what might be a real life future phone, a possible successor to the “spilling ages” phones. In a bunch of several other preceding applications (like application n. PCT/KR2017/001020, pubblication n. WO 2017/135651, Korean priority N. 10-2016-0015226 filed on 05.02.2016 published in August 2017 and other) Samsung has already anticipated the similar design, demonstrating also a possibility to fold the screen in several different points. Just a month before, in July 2017 another Samsung’s PCT patent application n. WO/2017/126886 (publication n. WO/2017/126886) showed what might be launched under Galaxy Note series in the nearest future according to Dailymail and the Guardian newspapers. Chris Kieffer, an art director and UI designer who worked for many of futuristic films, like Pacific Rim, Geo Storm, Transcendance , etc., have also anticipated in American TV series Westworld what Samsung now projects into reality. Westworld UI – A Supercut from madebysan on Vimeo. Along with Youm, presented at CES in 2013, the company has also launched a futuristic concept video, designed to introduce us into an era of “flexible devices”. Though the similar foldable device was patented by the company in 2012 (PCT/KR2013/009765, published in May 2014, Korean priority n. 10-2012-0128755 14.11.2012; PCT/KR2013/008912, published in april 2014, Korean priority n. KR 10-2012-0110913 05.10.2012; ), in the following years dozens of patent applications followed for the similar device and the connected technology. Now it seems like Samsung’s challenge to market it in 2018 is more real than ever. Despite all the technical solutions found by the company in the meanwhile, the mass production might still be an issue not so much for the screen’s flexibility, as for the hardware solution that might permit its desired functionality. Another interesting concept that might finally see its real-life incarnation in the nearest future is an electronic device that can be shaped as a bracelet or be used flat. This type of flexible device was already anticipated with patent application n. WO/2013/089392 published in June 2013 (with priority n. KR 10-2011-0136596 16.12.2011), which, in fact, featured a bendable display device and the displaying method. Now, application n. WO/2017/105048 published in June 2017 with Korean priority of December 2015, outlines a device and a method of its manufacturing that features different configurations: from flat to round shape. A number of other patent applications cover various aspects of manufacturing and functioning of the concept: pubblication number US20170263891, filed on 10.03.2017 and published in september 2017 (Korean Priority 10-2016-0029668 of 11.03.2016), PCT/KR2016/015266 (publ.n. : WO2017116095 fo 06.07.2017, Korean priority KR 10-2015-0187722 of 28.12.2015), pubblication number US20170186132 published on 29.06.2017 (Korean priority 10-2015-0187722 28.12.2015 KR) and others feature simiarly the same device, its method of manufacturing and display management. 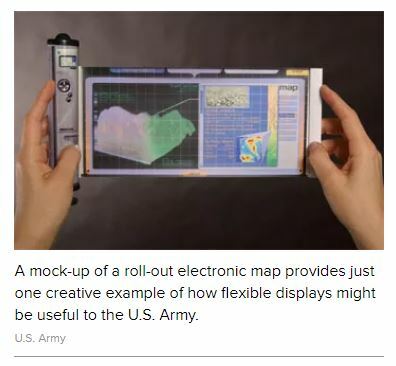 The idea of a “flexible screen” is not new; it seems like the U.S. Army was interested in such devices from the early years of this century. The Flexible Electronics and Display Center of the Arizona State University was established in 2004 by the U.S. Army and it develops the advanced flexible, lightweight and low-power devices for commercial and military applications. And what if the future was, in fact, after “stretchable” displays, which can display images also when displays are stretched by external forces. 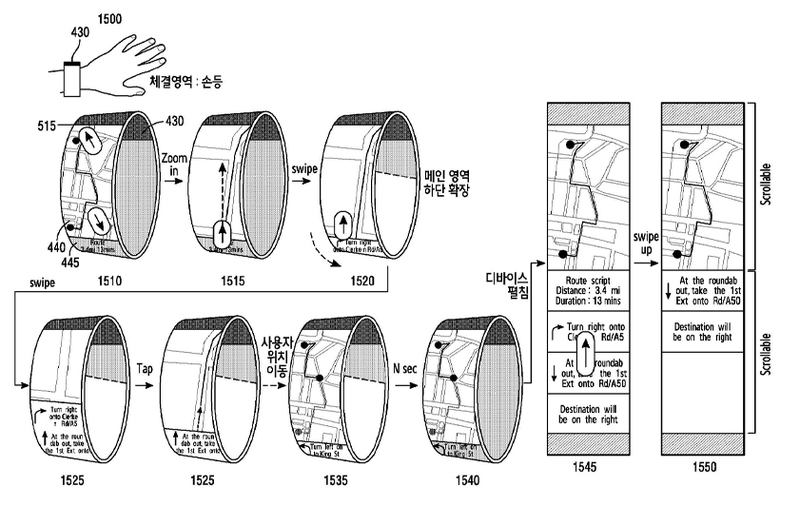 So, for instance, the same bracelet type device might use the stretching screen technology in the way to adjust to any wrist size: Samsung patent application publication number US20160212837 featuring the title STRETCHABLE DISPLAY DEVICE (application n. 14799977, application date 15.07.2015, publication n. 20160212837, publication date 21.07.2016). In November 2014 Samsung filed a Korean patent application n. 10-2014-0164612 (US application number 14694630, grant number 09639122, publication number US20160147327 of 26.05.2016) illustrating the way another type of a device with a stretchable screen might function. Though, the step from what is described in the patent application and the real-life operation and mass production seems long, the company is continuing to work on the stretchable screen idea and several other patent applications covering the relative technology and devices were filed in the meantime: publication n. US20160239051 (grant n. 09746884 of 29.08.2017, application n. 14874695, of 05.10.2015, Korean priority n. 10-2015-0022407 of 13.02.2015), publication n. KR1020150081628 (application n.: 1020140001308, application date 06.01.2014, publication date 15.07.2015 etc.). However, if you fancy a more compact device, the one with a flexible roll in / roll out display might be a convenient option for you. In a US patent application publication n. US20170309226 (of 26.10.2017, application n. 15382068 of 16.12.2016) a flexible display device including a rollable display panel and a method for compensating image of flexible display are featured. Also, this concept is relatively not so new: in 2012 – 2013 Samsung filed several patent applications featuring this idea: publication n. US20130314387 (application n. 13826922 of 14.03.2013), publication n. US20130314762 (application n. 13826325 of 14.03.2013) and some other applications clearly outlined the trend. Still after so many years it’s difficult to say when exactly we will see these concepts really working and neither we may know if all of them will be suitable for mass production and real life challenges.